There's a line in the Carly Simon song "Legend in Your Own Time" that goes, "this isn't exactly what we had planned." In some ways, this sums up the NASCAR season after the first four races of 2018. This was supposed to be the coming out party for the new stars of NASCAR. Instead, a 42-year-old former champion has stolen all of their heat. 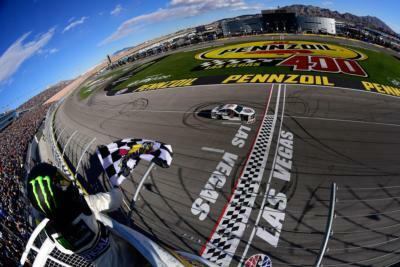 Kevin Harvick demolished the competition, what little there was, that is, at Atlanta and Las Vegas. Penalties and fines followed his Vegas win after a suspicious-looking rear window was discovered in post-race inspection. Never mind. That just seemed to fuel his fire as he went on to win for a ninth time at ISM Speedway in Phoenix. So after four races, the second-oldest driver in NASCAR — if 42 can be considered old — is schooling all the youngsters. Can I please have a show of hands from everyone who saw this coming? OK, you can put them down now. Harvick's on fire and as the Talking Heads once sang, he's "burning down the house, 365 degrees." Don't be shocked if he sweeps the entire West Coast swing. Now wouldn't that be a trick? It appears that year two under the Ford umbrella has turned Stewart-Haas Racing into a super team. The way they are running now, it's not a stretch to see Aric Almirola, Clint Bowyer and Kurt Busch all winning races this year. They are the kings of the mountain until someone pushes them off. The month of March has been owned by Harvick. He may have thinning hair and some gray in his beard, if he had one, yet he is a man on mission. As for the youngsters, at this moment they are forced to watch and learn. Yet, there is hope. Because as Shakespeare said, "April…hath put a spirit of youth in everything." For NASCAR's kiddie corps, April can't arrive fast enough. What are the chances someone outside the top 20 in points win Talladega?